Give your chord progressions colour and flair by introducing a handful of ‘out of key’ notes. We’ve previously looked at diatonic chords, ie, chords belonging to a scale or key. As their name suggests, non-diatonic chords contain at least one note from outside of the key, and they perform a range of musical functions. They can provide moments of colour - especially useful when using the major scale, which, after all, is used heavily in cheesy nursery rhyme melodies, so it needs a bit of flair. They can also be used in sophisticated progressions that hint at other keys within a single piece and to make chord changes sound more striking than they might when using only diatonic chords. Before you get into non-diatonic chords, it’s worth taking a look at chords that do use notes from a key signature. Whatever the starting note, chords in a major scale follow this pattern: major, minor, minor, major, major, minor, diminished. 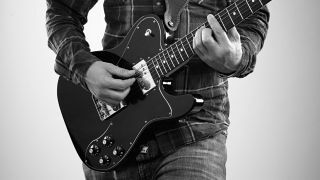 This simple progression uses four chords from the key of G major. As we’re only using notes from the scale, the chords sound safe and as if they naturally belong together. Non-diatonic chords are often used as passing chords. In its most basic form this may simply be a chord that is one fret above or below a diatonic chord. This gives a temporary ‘wrong’ sound with an unexpected twist that’s quickly resolved when the next diatonic chord is heard. We’ve added a non-diatonic C# chord to the previous example to connect the C and D chords. Switch between the audio tracks to hear how the C# changes the character of the music. Our final example shows some other ways to use non-diatonic chords. First, the C chord is followed by Cm (which contains a non-diatonic Eb note) for a Beatles-y vibe. Next we’ve used E (instead of the diatonic Em) to ‘pull’ more strongly towards the Am chord. The Ab7 is a jazzy substitution for a D7 chord (D7 would be diatonic: D F# A C).